Aim and Objectives: The purpose of this study was to describe the radiographic characteristics of odontogenic maxillary sinusitis as seen on cone beam computed tomography (CBCT) scans and determine whether any tooth or any tooth root, was more frequently associated with this disease. Materials and Methods: The present study included 500 CBCT images that included the entire maxillary sinus of both the sides in all the three planes. The modified classification of Abrahams and Glassberg was used to assess maxillary sinusitis of odontogenic origin. Furthermore, the proximity of the tooth root to the sinus floor, periapical pathology, and the septae within the maxillary sinus were also assessed. Results: In the present study, 1000 hemimaxillas were analyzed. Majority of the cases (74.9%) the apex of either tooth was touching the floor of the sinus. While 16.9% were in close relationship to the sinus while 8.2% of the cases, the apices were present within the sinus. Furthermore, in the present study, 38 of the total cases had an odontogenic cause of maxillary sinusitis, whereas 273 of them had a nonodontogenic cause, 96 have an undetermined cause, and the rest 593 cases had healthy sinus. Conclusion: The incidence of odontogenic sinusitis is likely under-reported in the available literature. 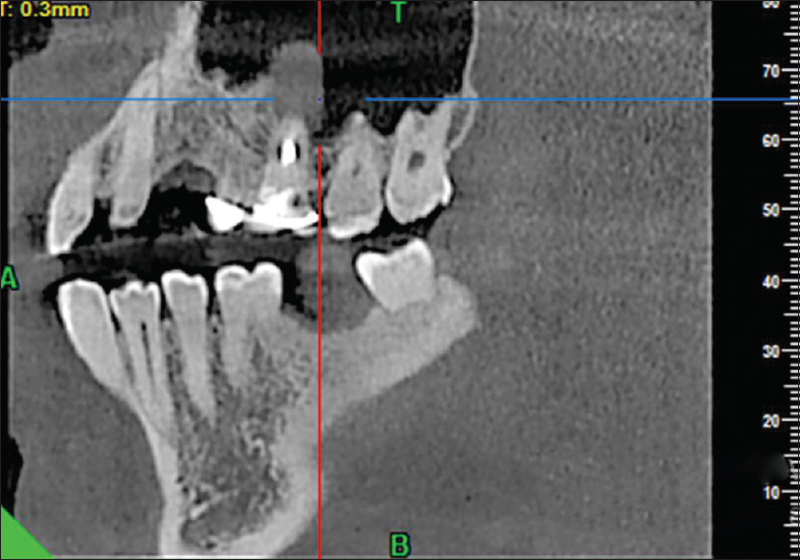 The introduction of low-dose CBCT is particularly useful to establish a definitive diagnosis to augment in the treatment of chronic maxillary sinusitis of odontogenic origin. Odontogenic pain originating from the maxillary sinus can pose a diagnostic challenge for the clinician. As the roots of the maxillary posterior teeth are close to the floor of the sinus, along with common innervation, there is a probable reason for pathosis of the sinus to cause dental symptoms. It is believed that the breach of the Schneiderian membrane owing to microbial incursion in periapical infections, periodontal disease or iatrogenic factors increases the risk of maxillary sinusitis. The progress of a periapical lesion in maxillary posterior teeth can give rise to inflammatory changes in the mucosal lining of the maxillary sinus and subsequently, the development of sinusitis. The extension of periapical inflammation into the maxillary sinus was first described in 1943 by Bauer. This was a cadaveric study with microscopic evaluation of sections of human teeth, alveolus, and sinus. Periapical inflammation was found to be proficient for affecting the sinus mucosa with or without perforation of the cortical bone of the sinus floor. Radiographic imaging has always played an imperative role in establishing the odontogenic etiology of (mostly chronic) maxillary sinusitis and complement results of the clinical examination. The purpose of this retrospective study was to describe the radiographic characteristics of odontogenic maxillary sinusitis as seen on cone beam computed tomography (CBCT) scans and to determine whether any tooth or any tooth root, was more frequently associated with this disease. The present study included 500 CBCT images that included the entire maxillary sinus of both the sides in all the three planes. The source of data for the study was patients that reported to the department of oral medicine and radiology from January 2017 to 2018. The CBCT had been advised for the evaluation of teeth in the posterior region of maxilla for various diagnostic purposes. A prior ethical approval was obtained from the Institutional Ethical Committee (Letter No: KIIT/KIDS/IEC0345) before the start of the study. The CBCT scans were done using Hyperion X9 digital imaging system (Myray, Italy). The images were obtained at 70–75 kV, 8–10 mA, and 11–12.3 s exposure time. The field of view size was 11 mm × 8 mm with a 300-μm image resolution. For evaluation of the CBCT scans, a 21-inch LCD monitor's (HP L1910, Hewlett-Packard Development Co., Palo Alto, CA, USA) with 1280 × 1024 pixel was used. The NNT Imaging Software (v4.6) Windows edition (Myray, Italy) was used. Images were selected considering a high-level technical standard (i.e., appropriate sharpness, density, and contrast), clearly showing the maxillary posterior teeth apices and the sinuses floor. An assessment of the topographic relationship of each root to the maxillary sinus floor was conducted in CBCT images. For the purpose of this study, diagnostic criteria for sinusitis diagnosis were developed based on published literature. Based on these criteria, the maxillary sinusitis/pathology was divided into four categories [Figure 1], [Figure 2], [Figure 3], [Figure 4], [Figure 5], [Figure 6]. 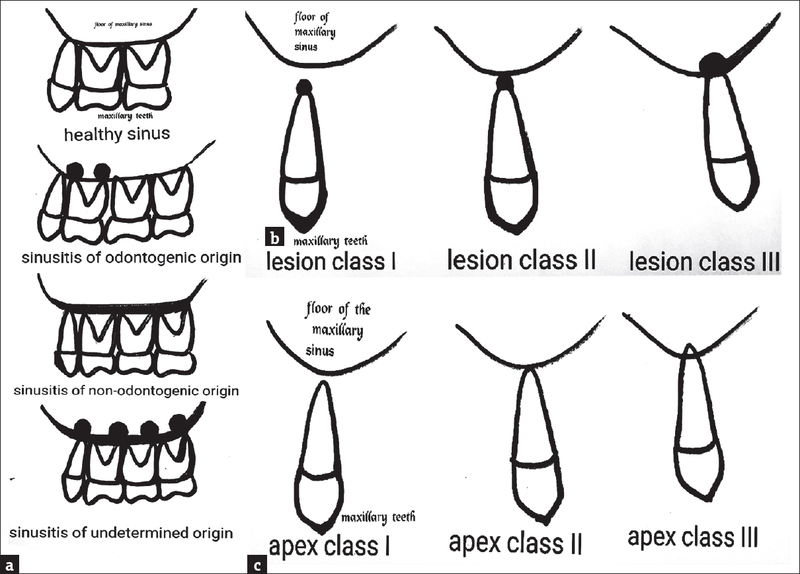 The relationship of the tooth apex to the floor of the maxillary sinus and periapical lesion to the floor of the maxillary sinus is depicted in [Figure 1]. In the present study, 1000 hemimaxillas were analyzed. A total of 500 participants including 314 males and 186 females participated in the study. All the participants in the present study were adults and were between the ages of 25–65 years. In the present study, descriptive statistics was used to summarize the features of odontogenic and nonodontogenic sinusitis. Statistical Package for the Social Sciences (SPSS; IBM, California, USA) version 20.0 was used to perform the statistical analysis. Student's t-test was used to assess the relation (P < 0.05 was considered to be statistically significant) between the odontogenic pathology and maxillary sinus infection. In general, the apices of premolars and molars are in close proximity to the floor of the maxillary sinus. Majority of the cases (74.9%), the apex of either tooth was touching the floor of the sinus. A total of 16.9% of the cases had a close relationship to the sinus while 8.2% of the cases the apices were present within the sinus [Table 1]. In the present study, out of the 1000 maxillary sinus, 606 were healthy, 387 had sinusitis, six had mucous retention cyst, and only one participant had calcification within the maxillary sinus [Table 2]. On the other hand, out of the 1000 hemimaxillas, 671 cases had healthy teeth while 139 (out of 1000) had a history of extraction done of which 69 cases had healthy sinus whereas 70 of them had sinus pathology. Fifty-eight (out of 1000) had a history of root canal treatment done in which the ratio of healthy and diseased sinus was equal. Sixty (out of 1000) had periodontitis out of which only nine cases had healthy sinus, while the others had diseased sinus. Seventeen (out of 1000) had periapical pathology out of which only three had a healthy sinus while the rest 14 had diseased sinus. Forty-seven (out of 1000) had carious teeth with no periapical pathology out of which 21 had a healthy sinus whereas 26 had diseased sinus. Similarly, eight (out of 1000) had restorations done in the teeth out of which seven had healthy sinus whereas only one had a diseased sinus [Table 3]. Interestingly, majority of the cases having either periodontitis or periapical pathology had sinus pathology. Majority of the cases 749 (out of 1000) the apices of the teeth were touching the sinus floor of which 294 had a sinus pathology whereas 455 were normal. Similarly, 82 (out of 1000) of the cases had the apices of the teeth within the sinus cavity of which 44 had sinus pathologies while 38 were healthy [Table 4]. Out of the 1000 hemimaxillas, 361 had periapical pathology. In 270 (out of 361) cases, the periapical lesion was in close proximity to the sinus of which 125 had no sinus pathology while 145 had diseased sinus. In 54 (out of 361) cases, the periapical lesion was touching the floor of the maxillary sinus of which 18 had no sinus pathology while 36 had diseased sinus. Similarly, in 37 (out of 361) cases, the periapical lesion was present within the maxillary sinus of which only 10 had a healthy sinus while 27 had diseased sinus [Table 5]. An extensive search for various articles was done through Google Scholar, PubMed, Cochrane Library, and EMBASE. It included all articles published between the year 2000 and 2018. The keywords used were “odontogenic sinusitis,” “chronic maxillary sinusitis,” “sinusitis of dental origin,” “sinusitis of undetermined origin,” “chronic apical periodontitis,” “periapical pathology and sinusitis,” and “iatrogenic sinusitis.” All the articles including case reports, case series, review, retrospective, and prospective studies were sorted out to gather all descriptions regarding odontogenic cause of maxillary sinusitis, and the type of imaging modality used,,,,,,,,,,,,,,,,,,,,,,, [Table 6]]. However, the interpretation of CBCT must be carried out cautiously as incipient and chronic periapical lesions detected by a CBCT examination might present low potential for identifying sinus inflammatory signs and symptoms. CBCT is far superior to multislice CT in terms of image resolutions, as thinner sections can be achieved. Apart from that CBCT equipment have reduced radiation exposures and a low equipment cost when compared to multi-slice CT. In a study done by Cha et al. they found various abnormalities of maxillary sinus such as acute sinusitis with a prevalence of 7.5%, retention cyst with a prevalence of 3.5% and polypoid mucosal thickening in 2.3% of the cases, respectively. In addition, in previous studies, the prevalence of flat mucosal thickening of the maxillary sinus ranged from 23.7% to 38.1%, polypoid mucosal thickening ranged from 6.5% to 19.4%, acute maxillary sinusitis 3.6%, partial opacification of maxillary sinus 12%, and total opacification of maxillary sinus 7%, respectively., Several authors have reported that around 10%–12% of the total maxillary sinus pathology has an odontogenic cause.,, In the present study, 51.8% of the participants had odontogenic sinusitis, whereas 65.4% of the total participants had a diseased maxillary sinus along with periapical lesions. This was in accordance with the previously computed tomography studies that demonstrated around 71%–86% of sinus infections have an odontogenic cause. The incidence of odontogenic sinusitis is likely under-reported in the available literature. 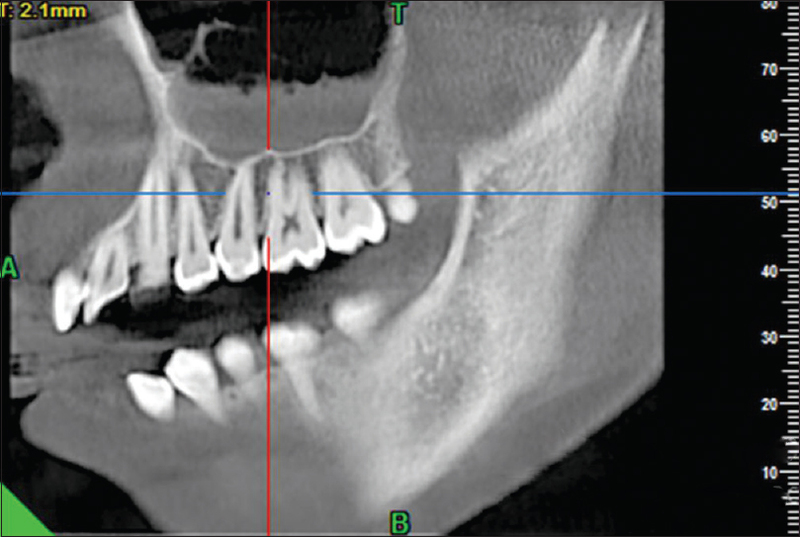 Radiographic analysis plays a pivotal role in the diagnosis of odontogenic sinusitis. It has been established in the published literature that 2D-imaging modalities may obscure the origin of odontogenic maxillary sinusitis. 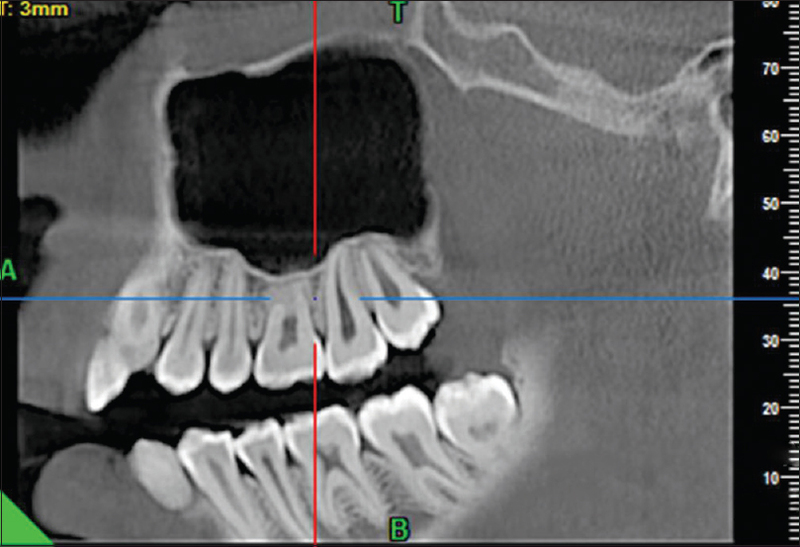 The introduction of low-dose CBCT is particularly useful to establish a definitive diagnosis to augment in the treatment of chronic maxillary sinusitis of odontogenic origin. Radman WP. The maxillary sinus; Revisited by an endodontist. J Endod 1983;9:382-3. Watzek G, Bernhart T, Ulm C. Complications of sinus perforations and their management in endodontics. Dent Clin North Am 1997;41:563-83. Low KM, Dula K, Bürgin W, von Arx T. Comparison of periapical radiography and limited cone-beam tomography in posterior maxillary teeth referred for apical surgery. J Endod 2008;34:557-62. Maloney PL, Doku HC. Maxillary sinusitis of odontogenic origin. J Can Dent Assoc (Tor) 1968;34:591-603. Bauer W. Maxillary sinusitis of dental origin. Am J Orthod Oral Surg 1943;29:133-513. Bogaerts P, Hanssens JF, Siquet JP. Healing of maxillary sinusitis of odontogenic origin following conservative endodontic retreatment: Case reports. Acta Otorhinolaryngol Belg 2003;57:91-7. Abrahams JJ, Glassberg RM. Dental disease: A frequently unrecognized cause of maxillary sinus abnormalities? AJR Am J Roentgenol 1996;166:1219-23. Arias-Irimia O, Barona-Dorado C, Santos-Marino JA, Martínez-Rodriguez N, Martínez-González JM. Meta-analysis of the etiology of odontogenic maxillary sinusitis. Med Oral Patol Oral Cir Bucal 2010;15:e70-3. Brüllmann DD, Schmidtmann I, Hornstein S, Schulze RK. Correlation of cone beam computed tomography (CBCT) findings in the maxillary sinus with dental diagnoses: A retrospective cross-sectional study. Clin Oral Investig 2012;16:1023-9. Lu Y, Liu Z, Zhang L, Zhou X, Zheng Q, Duan X, et al. Associations between maxillary sinus mucosal thickening and apical periodontitis using cone-beam computed tomography scanning: A retrospective study. J Endod 2012;38:1069-74. Rege IC, Sousa TO, Leles CR, Mendonça EF. Occurrence of maxillary sinus abnormalities detected by cone beam CT in asymptomatic patients. BMC Oral Health 2012;12:30. Shanbhag S, Karnik P, Shirke P, Shanbhag V. Association between periapical lesions and maxillary sinus mucosal thickening: A retrospective cone-beam computed tomographic study. J Endod 2013;39:853-7. Dobele I, Kise L, Apse P, Kragis G, Bigestans A. Radiographic assessment of findings in the maxillary sinus using cone-beam computed tomography. Stomatologija 2013;15:119-22. Pokorny A, Tataryn R. Clinical and radiologic findings in a case series of maxillary sinusitis of dental origin. Int Forum Allergy Rhinol 2013;3:973-9. Shiki K, Tanaka T, Kito S, Wakasugi-Sato N, Matsumoto-Takeda S, Oda M, et al. The significance of cone beam computed tomography for the visualization of anatomical variations and lesions in the maxillary sinus for patients hoping to have dental implant-supported maxillary restorations in a private dental office in Japan. Head Face Med 2014;10:20. Saibene AM, Pipolo GC, Lozza P, Maccari A, Portaleone SM, Scotti A, et al. Redefining boundaries in odontogenic sinusitis: A retrospective evaluation of extramaxillary involvement in 315 patients. Int Forum Allergy Rhinol 2014;4:1020-3. Block MS, Dastoury K. Prevalence of sinus membrane thickening and association with unhealthy teeth: A retrospective review of 831 consecutive patients with 1,662 cone-beam scans. J Oral Maxillofac Surg 2014;72:2454-60.
von Arx T, Fodich I, Bornstein MM. Proximity of premolar roots to maxillary sinus: A radiographic survey using cone-beam computed tomography. J Endod 2014;40:1541-8. Matsumoto Y, Ikeda T, Yokoi H, Kohno N. Association between odontogenic infections and unilateral sinus opacification. Auris Nasus Larynx 2015;42:288-93. Malina-Altzinger J, Damerau G, Grätz KW, Stadlinger PD. Evaluation of the maxillary sinus in panoramic radiography – A comparative study. Int J Implant Dent 2015;1:17. Shahbazian M, Vandewoude C, Wyatt J, Jacobs R. Comparative assessment of periapical radiography and CBCT imaging for radiodiagnostics in the posterior maxilla. Odontology 2015;103:97-104. Tian XM, Qian L, Xin XZ, Wei B, Gong Y. An analysis of the proximity of maxillary posterior teeth to the maxillary sinus using cone-beam computed tomography. J Endod 2016;42:371-7. Roque-Torres GD, Ramirez-Sotelo LR, Vaz SL, Bóscolo SM, Bóscolo FN. Association between maxillary sinus pathologies and healthy teeth. Braz J Otorhinolaryngol 2016;82:33-8. Schreindorfer K, Kiss Á, Marada G. Maxillary sinusitis as a diagnostical adverse finding of the dental cone-beam computed tomography study. Orv Hetil 2017;158:1747-53. Zirk M, Dreiseidler T, Pohl M, Rothamel D, Buller J, Peters F, et al. Odontogenic sinusitis maxillaris: A retrospective study of 121 cases with surgical intervention. J Craniomaxillofac Surg 2017;45:520-5. Ata-Ali J, Diago-Vilalta JV, Melo M, Bagán L, Soldini MC, Di-Nardo C, et al. What is the frequency of anatomical variations and pathological findings in maxillary sinuses among patients subjected to maxillofacial cone beam computed tomography? A systematic review. Med Oral Patol Oral Cir Bucal 2017;22:e400-9. Dau M, Marciak P, Al-Nawas B, Staedt H, Alshiri A, Frerich B, et al. Evaluation of symptomatic maxillary sinus pathologies using panoramic radiography and cone beam computed tomography-influence of professional training. Int J Implant Dent 2017;3:13. Vestin Fredriksson M, Öhman A, Flygare L, Tano K. When maxillary sinusitis does not heal: Findings on CBCT scans of the sinuses with a particular focus on the occurrence of odontogenic causes of maxillary sinusitis. Laryngoscope Investig Otolaryngol 2017;2:442-6. 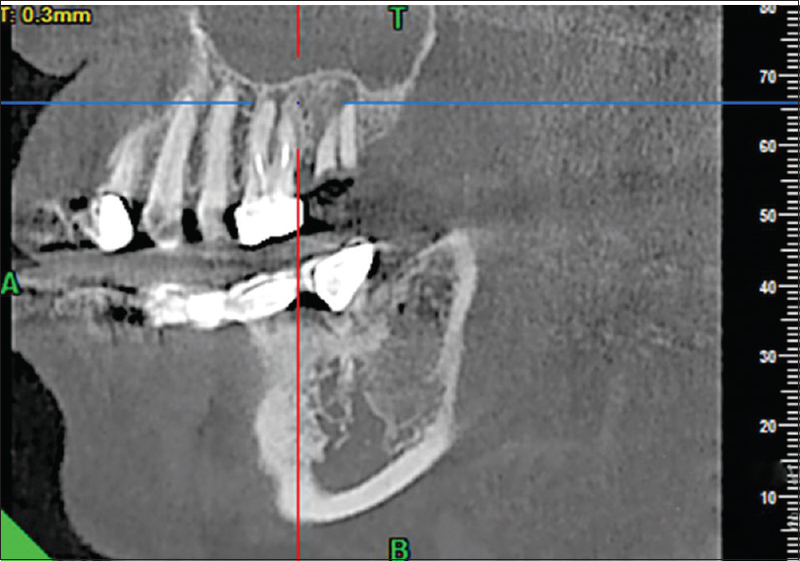 Aksoy U, Orhan K. Association between odontogenic conditions and maxillary sinus mucosal thickening: A retrospective CBCT study. Clin Oral Investig 2019;23:123-31. Little RE, Long CM, Loehrl TA, Poetker DM. Odontogenic sinusitis: A review of the current literature. Laryngoscope Investig Otolaryngol 2018;3:110-4. Vallo J, Suominen-Taipale L, Huumonen S, Soikkonen K, Norblad A. Prevalence of mucosal abnormalities of the maxillary sinus and their relationship to dental disease in panoramic radiography: Results from the health 2000 health examination survey. Oral Surg Oral Med Oral Pathol Oral Radiol Endod 2010;109:e80-7. Diament MJ, Senac MO Jr., Gilsanz V, Baker S, Gillespie T, Larsson S, et al. Prevalence of incidental paranasal sinuses opacification in pediatric patients: A CT study. J Comput Assist Tomogr 1987;11:426-31. Bender IB, Seltzer S. Roentgenographic and direct observation of experimental lesions in bone: II 1961. J Endod 2003;29:707-12. Van Assche N, Jacobs R, Coucke W, van Steenberghe D, Quirynen M. Radiographic detection of artificial intra-bony defects in the edentulous area. Clin Oral Implants Res 2009;20:273-9. Estrela C, Bueno MR, Leles CR, Azevedo B, Azevedo JR. Accuracy of cone beam computed tomography and panoramic and periapical radiography for detection of apical periodontitis. J Endod 2008;34:273-9. White S, Pharaoh M. Advanced imaging modalities. Oral Radiology: Principles and Interpretation. 6th ed., Ch. 13. St. Louis: Mosby; 2009. p. 207-24. Eberhardt JA, Torabinejad M, Christiansen EL. A computed tomographic study of the distances between the maxillary sinusfloor and the apices of the maxillary posterior teeth. Oral SurgOral Med Oral Pathol 1992;73:345-6. Kilic C, Kamburoglu K, Yuksel SP, Ozen T. An assessment of the relationship between the maxillary sinus floor and the maxillary posterior teeth root tips using dental cone-beam computerized tomography. Eur J Dent 2010;4:462-7. Sharan A, Madjar D, Hashomer T. Correlation between maxillary sinus floor topography and related root position of posterior teeth using panoramic and cross-sectional computed tomography imaging. Oral Surg Oral Med Oral Pathol Oral Radiol Endod 2006;102:375-81. Wehrbein H, Diedrich P. The initial morphological state in the basally pneumatized maxillary sinus – A radiological-histological study in man. Fortschr Kieferorthop 1992;53:254-62. Mehra P, Jeong D. Maxillary sinusitis of odontogenic origin. Curr Allergy Asthma Rep 2009;9:238-43. Hauman CH, Chandler NP, Tong DC. Endodontic implications of the maxillary sinus: A review. Int Endod J 2002;35:127-41. Lofthag-Hansen S, Huumonen S, Gröndahl K, Gröndahl HG. Limited cone-beam CT and intraoral radiography for the diagnosis of periapical pathology. Oral Surg Oral Med Oral Pathol Oral Radiol Endod 2007;103:114-9. Nogi T, Kanazawa E. Morphometry of the maxillary sinus and the relationship between the sinus base and the tooth roots. J Oral Sci 2001;27:227-34. Obayashi N, Ariji Y, Goto M, Izumi M, Naitoh M, Kurita K, et al. Spread of odontogenic infection originating in the maxillary teeth: Computerized tomographic assessment. Oral Surg Oral Med Oral Pathol Oral Radiol Endod 2004;98:223-31. Thunthy KH. Diseases of the maxillary sinus. Gen Dent 1998;46:160-5. Carmeli G, Artzi Z, Kozlovsky A, Segev Y, Landsberg R. Antral computerized tomography pre-operative evaluation: Relationship between mucosal thickening and maxillary sinus function. Clin Oral Implants Res 2011;22:78-82. Mehra P, Murad H. Maxillary sinus disease of odontogenic origin. Otolaryngol Clin North Am 2004;37:347-64. Lim WK, Ram B, Fasulakis S, Kane KJ. Incidental magnetic resonance image sinus abnormalities in asymptomatic Australian children. J Laryngol Otol 2003;117:969-72. Gordts F, Clement PA, Destryker A, Desprechins B, Kaufman L. Prevalence of sinusitis signs on MRI in a non-ENT paediatric population. Rhinology 1997;35:154-7. Melén I, Lindahl L, Andréasson L, Rundcrantz H. Chronic maxillary sinusitis. Definition, diagnosis and relation to dental infections and nasal polyposis. Acta Otolaryngol 1986;101:320-7. Engström H, Chamberlain D, Kiger R, Egelberg J. Radiographic evaluation of the effect of initial periodontal therapy on thickness of the maxillary sinus mucosa. J Periodontol 1988;59:604-8. Bhattacharyya N. Do maxillary sinus retention cysts reflect obstructive sinus phenomena? Arch Otolaryngol Head Neck Surg 2000;126:1369-71. Mathew AL, Pai KM, Sholapurkar AA. Maxillary sinus findings in the elderly: A panoramic radiographic study. J Contemp Dent Pract 2009;10:E041-8. Cha JY, Mah J, Sinclair P. Incidental findings in the maxillofacial area with 3-dimensional cone-beam imaging. Am J Orthod Dentofacial Orthop 2007;132:7-14. Pazera P, Bornstein MM, Pazera A, Sendi P, Katsaros C. Incidental maxillary sinus findings in orthodontic patients: A radiographic analysis using cone-beam computed tomography (CBCT). Orthod Craniofac Res 2011;14:17-24. Ritter L, Lutz J, Neugebauer J, Scheer M, Dreiseidler T, Zinser MJ, et al. Prevalence of pathologic findings in the maxillary sinus in cone-beam computerized tomography. Oral Surg Oral Med Oral Pathol Oral Radiol Endod 2011;111:634-40. Brook I. Sinusitis of odontogenic origin. Otolaryngol Head Neck Surg 2006;135:349-55. Diament MJ, Senac MO, Gilsanz V, Baker S, Gillespie T, Larsson S. Prevalence of incidental paranasal sinuses opacification in pediatric patients: a CT study. J Comput Assist Tomogr 1987;11:426-31. Havas TE, Motbey JA, Gullane PJ. Prevalence of incidental abnormalities on computed tomographic scans of the paranasal sinuses. Arch Otolaryngol Head Neck Surg 1988;114:856-9. Bolger WE, Butzin CA, Parsons DS. Paranasal sinus bony anatomic variations and mucosal abnormalities: CT analysis for endoscopic sinus surgery. Laryngoscope 1991;101:56-64.